Why do we need a hand and foot massage once in a while...? tasks of everyday life, such as walking or driving, puts a strain on them...causing tension. Did you know... that your feet and hands help set the tension and stress level for the rest of your body? With tension and stress, comes fatigue... the combination of which impacts how your whole body functions and moves-together they add up to a critical point. The continued build up of tension and stress can cause a number of diseases, disorders, and early aging... and some form of relief is more important than ever! When your hands or feet are massaged, a focused pressure is applied on known "reflex" points... which interrupts the pain signal-and helps reset the body's ability to relax. It is a non-invasive massage which eases the muscular tensions that build up throughout the body... and is suitable for any age group-toddlers to seniors. Many people who suffer from osteoarthritis or arthritis use hand and foot massage therapy to cope with their disease and... while massage therapy cannot cure or stop the progression of either of these conditions—it can ease the symptoms associated with inflammation, and help improve your mobility and quality of life. A simple hand and/or foot massage from Wendy, Lily, Angela or Little Amy can make a world of difference-you'll feel better in minutes. If your feet are ticklish... not to worry—a firm pressure is applied. FROM A TODDLER TO THE ADULT… HAND AND FOOT MASSAGE IS GOOD FOR YOU! At Wendy's Massage... there is a massage type and technique offered that will meet everyone's individual needs-from a pampering Chinese relaxation massage to Cai Bei and Tui Na therapy. As Wendy cannot perform every type of massage for her customers... she has teamed up to collaborate with other independent therapists who specialize in a wide variety of other world class techniques... each offering their special skills—so that the widest variety of massage techniques can be offered for your therapeutic pleasure. 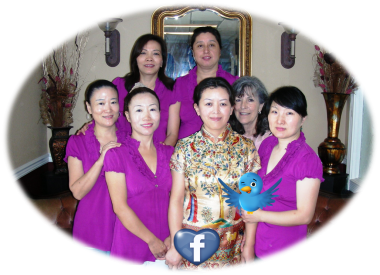 Wendy is proud to offer these truly unique skills of authentic Chinese massage therapy here in Chico... by collaborating and sharing her beautiful massage facilities with other therapists.